Every once in a while a game comes out that captivates the minds of the gaming community. Sometimes it only lasts a week, and other times it lasts much longer. #IDARB was the former. At the time it came out it garnered a lot of attention on social media and it took up not only my time, but the time of my friends as well, and deservedly so because it was an extraordinarily enjoyable experience. The actual game is very easy to explain. It’s basically handball. You try to throw a ball into a goal. It takes place in a small room with an upper, middle, and lower level. You have the ability to pass and knock the ball out of opposing player’s hands. There is a maximum of eight players allowed. The maximum amount of eight was a bit daunting; I found the sweet spot to be just four. With four players you cant still utilize team-based strategy but the screen doesn’t become overwhelmed with movement. As simple as it sounds it is actually much more complex when you actually play it. There is a lot of movement, even with just four, and it becomes very distracting, but that only adds to the charm. You are given a wide option of characters to play as ranging from Disney Princess’s to a taco. Yes, just a taco. You can also create your own characters and there is a QR code scanner that generates characters as well. 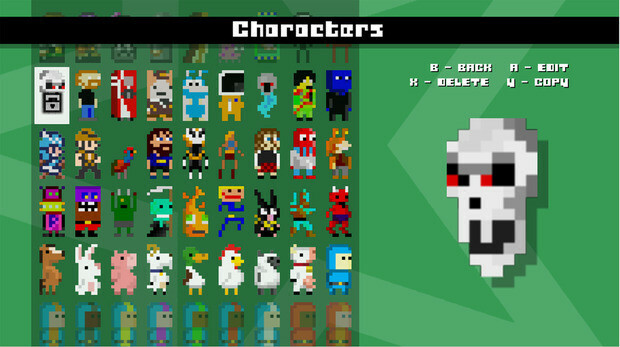 The available characters were another part of #IDARB I really enjoyed. The real appeal with #IDARB is the multiplayer. There is a single player experience but it is very short lived. It can easily be completed in 45 minutes. At halftime you are given mini-games to compete in. There are a variety of options, some of which are: hunting ducks, tug of war, and tanks. These mini-games are only available via multiplayer. I can't stress enough how much fun the multiplayer is. It contains features which keep it from becoming stagnant. It is actually one of the coolest features I have seen in gaming in a long time. It has to do with social media. Twitter integration is what set #IDARB apart from many experiences I've had in recent memory. I realize social media crossing the barrier and entering video games isn’t exactly a brand new concept. However, #IDARB has done it better than any other game that I can remember. Anyone can watch you play. With a simple tweet with a hashtag that is linked to your specific session they can impact your game directly. Each hashtag messes with the fabric of the game in a large variety of ways. They can make the screen spin, send Rick Astley across the screen, fill the arena with water, amongst many other options. This is a great feature because it allows friends who may not be directly playing with you to still feel involved in the game. Additionally, there is a live Twitter feed which may feature offensive content so beware. An uninterrupted 1v1 game is very entertaining. There is plenty of strategy and the learning curve is almost non-existent. You can go from completely clueless to fairly competitive in about 10 minutes. #IDARB was free to Xbox Live Gold Members. That offer may no longer be available but I do believe that it is worth paying for if you have people to play it with. As a standalone arcade game it isn’t worth much. The multiplayer is what makes it great, whether it be local or online. It offers a face paced and ever-changing game space that can be fun for everyone. Super Mega Baseball: Extra Innings is simply a fun game. There is something here for you whether your looking to find a non licensed baseball game with some depth, or just looking for a quick fun game to pick up every now and then. The lack of online functionality hinders it from reaching its full potential but the humorous tone and simple controls ensure the offline experience is very enjoyable. Kalimba is truly one of the most perfectly executed platformers that I have played thus far.